If pedigree is important to you.....than My Peruvian Yetti is the one. With names like Royal Fawn and Dom Lucillio on his Dam's side and Sired by Snowmass Invincible no wonder he has produced color champions in bright white with fantastic fiber. Don't miss the chance to bring this quality animal into your breeding program today! 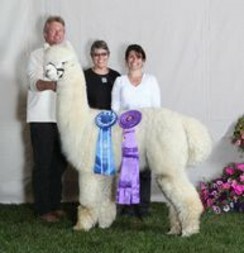 When Yetti produced a 13 Micron cria (tested at 10 months of age) for us, we knew he could add to our breeding program. He will do the same for you! Half Interest is now available! !